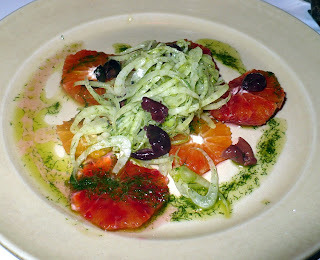 My family was in town for the holidays and we thought it would be fun to go to Chez Panisse. Although I called a month in advance (and they only take reservations one month in advance), by the time I called they were all booked on the days we could come for the restaurant, so we made a reservation in the cafe instead. The cafe was still delicious and everyone really enjoyed their meals. When all was said and done, including drinks, the bill was about 15 per person. This was simple and delicious. The sweetness of the oranges truly complemented the anise notes of the fennel and the bright, dill infused, dressing was an inspired addition. Not sure why this was labeled in the diminutive form, because it was quite large for an appetizer. Anyhow, it was very good. 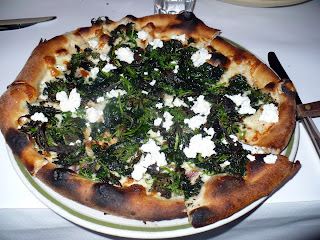 Chez Panisse has some of the best pizza outside of New York, complete with a crispy thin crust. 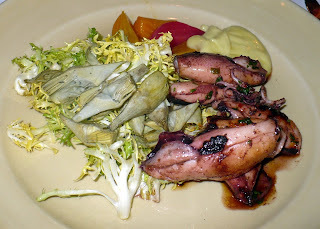 The squid were very tender and the sides were interesting and tasty. 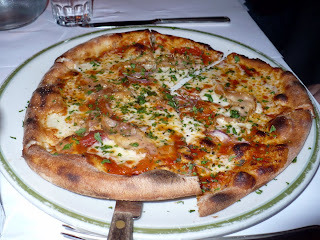 This was another tasty pizza, with a super crispy crust. For some reason, despite falling into a nettle patch as a child, I'm always drawn to eating nettles. 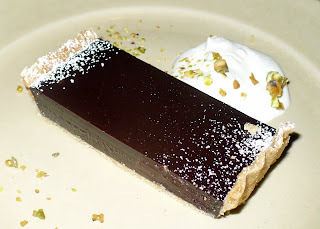 This was super chocolately and very rich. It should have been served with more whipped cream. That tart looks delicious. I just drooled on my dress.